Stand out from the crowd with Trim Illusions Chrome Tailgate Handle Covers. A little eye candy for your gate, these handles have style. Their triple-chrome finish reflects like a mirror and keeps your truck current. 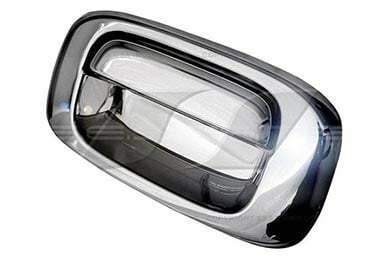 Trim Illusions ABS plastic Chrome Tailgate Handles keep their good looks in harsh weather. Their high-quality design won't yellow or age in the desert sun or Rocky Mountain snow. No matter where you take them, these tailgate handles reflect cool style you can't get anywhere else. What's more, these pieces install over your existing tailgate handle without you altering a thing. Deck your ride with modern chrome and get noticed today. No drilling or cutting required. Adds An Expensive Look To My Rear End! Very nice quality item. My tailgate has the camera mounted at the latch and the added trim obscures a small amount of the view at the bottom. I plan on using my Dremel tool to remove a little. Very simple installation, looks good and appears to be of good quality. But I feel the price is a bit too high! Very good quality, this is my second brand because the wide angle lens on camera was being blocked partially by cover on putco brand. It is also blocked on trim illusions brand but not as bad and with their square hole it was easily trimmed with razor knife without doing any damage and works perfectly. Place product on without attaching to test until you get it trimmed on each side. Reference # 766-630-137 © 2000-2019 AutoAnything, Inc.